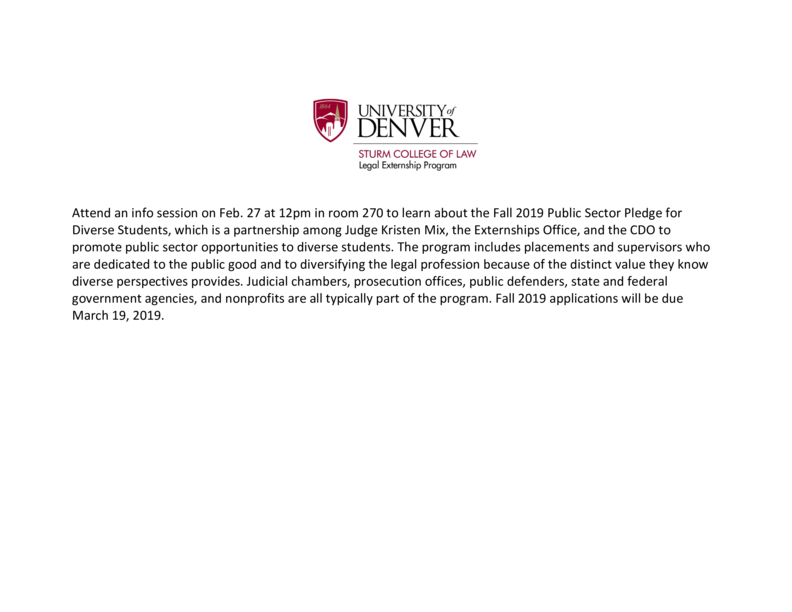 Attend an information session on Feb. 27 at 12pm in room 270 to learn about the Fall 2019 Public Sector Pledge for Diverse Students, which is a partnership among Judge Kristen Mix, the Externship Office, and the CDO to promote public sector opportunities to diverse students. The program includes placements and supervisors who are dedicated to the public good and to diversifying the legal profession because of the distinct value they know diverse perspectives provides. Judicial chambers, prosecution offices, public defenders, state and federal government agencies, and nonprofits are all typically part of the program. Fall 2019 applications will be due March 19, 2019.